The Ebola victim who is believed to have triggered the current outbreak – a two-year-old boy called Emile Ouamouno from Guinea – may have been infected by playing in a hollow tree housing a colony of bats, say scientists. They made the connection on an expedition to the boy’s village, Meliandou. They took samples and chatted to locals to find out more about Ebola’s source. The team’s findings are published in EMBO Molecular Medicine. Meliandou is a small village of 31 houses. It sits deep within the Guinean forest region, surrounded by towering reeds and oil palm cultivations – these are believed to have attracted the fruit bats carrying the virus passed on to Emile. During their four-week field trip in April 2014, Dr Fabian Leendertz and colleagues found a large tree stump situated about 50m from Emile’s home. Villagers reported that children used to play frequently in the hollow tree. 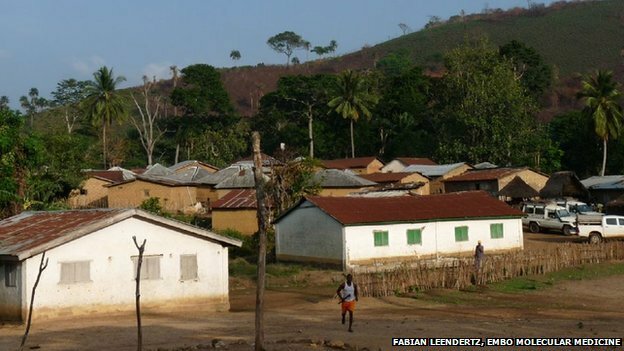 Emile – who died of Ebola in December 2013 – used to play there, according to his friends. 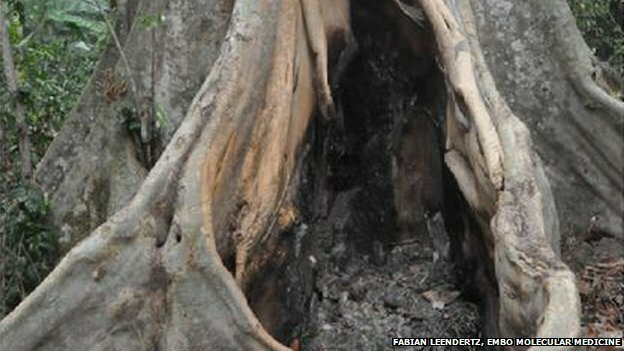 The villagers said that the tree burned on March 24, 2014 and that once the tree caught fire, there issued a “rain of bats”. A large number of these insectivorous free-tailed bats – Mops condylurus in Latin – were collected by the villagers for food, but disposed of the next day after a government-led ban on bushmeat consumption was announced. While bushmeat is thought to be a possible source of Ebola, the scientists believe it didn’t trigger the outbreak. Instead, it was Emile’s exposure to the bats and their droppings as he played with his friends in the hollowed tree. The scientists took and tested ash samples from the tree and found DNA traces that were a match for the animals. While they were unable to test any of the bushmeat that the villagers had disposed of, they captured and tested any living bats they could find in and around Meliandou. No Ebola could be detected in any of these hundred or so animals, however. 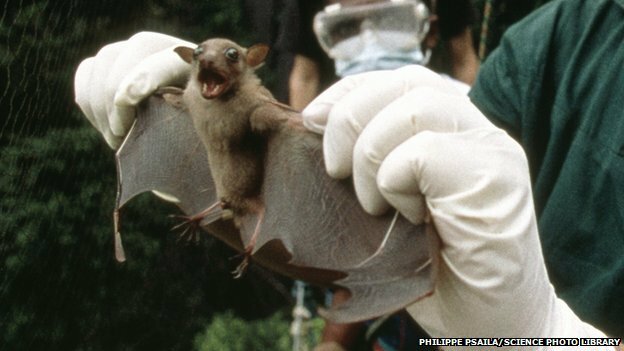 But previous tests show this species of bat can carry Ebola. Dr Leendertz, from the Robert Koch Institute in Germany, and his colleagues say this must be a pretty rare occurrence though. Dr Leendertz said: “That is also obvious when you think about how many tonnes of bat meat is consumed every year. He says it is vital to find out more about the bats. “They have moved into human settlements. They do not just live in the trees but also under the roofs of houses in the villages. But culling the animals is not the answer. “We need to find ways to live together with the wildlife. These bats catch insects and pests, such as mosquitoes. They can eat about a quarter of their body weight in insects a day. Putting the entire planet online… then controlling everything they see or read. Facebook is the pinnacle of social engineering, an online operant conditioning chamber – also known as a Skinner box – that is being used to track, trace, document, and manipulate half of the entire online population. Despite users attempting to utilize Facebook to connect and communicate with individuals and organizations of interest, Facebook has turned its features against users, insidiously manipulating their timelines to show selected posts and updates while “soft censoring” others to manage public perception. “Studies” have even been published proving the effectiveness of Facebook’s unethical social engineering. In one study, the emotions of users were successfully manipulated by selectively posting only negative or only positive posts from individuals or organizations on users’ contact lists. We show, via a massive (N = 689,003) experiment on Facebook, that emotional states can be transferred to others via emotional contagion, leading people to experience the same emotions without their awareness. We provide experimental evidence that emotional contagion occurs without direct interaction between people (exposure to a friend expressing an emotion is sufficient), and in the complete absence of nonverbal cues. Not only are the findings troubling – illustrating that Facebook possesses the ability to influence the emotions of its users unwittingly through careful manipulation of their news feeds – but the invasive, unethical methods by which Facebook conducted the experiment are troubling as well. In another experiment Facebook manipulated the news feed of some 2 million Americans in 2012 in order to increase public participation during that year’s US presidential election. Facebook was also an official sponsor of the US State Department’s training program preparing political subversion across North Africa and the Middle East years before the so-called “Arab Spring” unfolded. 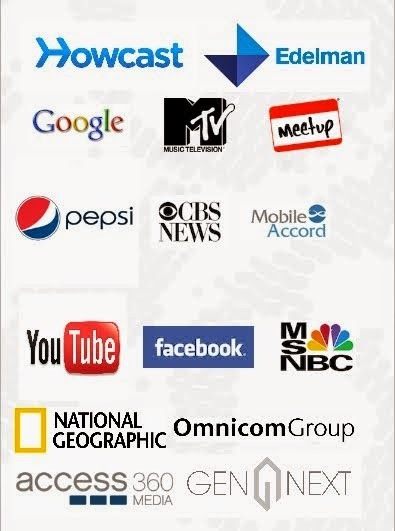 The very activists audiences around the world were told “spontaneously” sprung up across North Africa and the Middle East were in fact trained, funded, and equipped by the US State Department and various corporations including tech giants Google and Facebook years beforehand. Television “programming” could be perceived as both the process of programming what will appear on TV, but also could be perceived as programming the minds of those consuming television. TV, being a one-way process, effectively eliminates competing ideas and limits the scope of information down to only what those who control television networks want audiences to see and hear. It is clear that Facebook is part of a process to turn the Internet into a similar one-way experience. 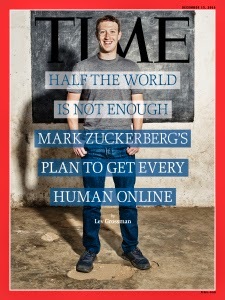 As a result of Facebook’s successful experiments in social engineering, including the very successful political subversion carried out across the Arab World – subversion still ravaging the region to this day – Facebook and the corporate-financier interests behind it seek to put the entire planet within this increasingly insidious, pervasive, and one-way network. Far from a college kid with an overgrown corporation, what Facebook is doing is the manifestation of every tyranny’s dream scenario since the beginning of human history – a means by which to completely and insidiously manipulate and control the minds of its subjects. To counteract what is clearly the next step in Facebook’s unethical and unchecked plague-like spread across the Internet, nations individually should produce their own alternatives to Facebook and work to get their populations online on their own terms before Facebook and the interests driving it do. Likewise, locally, communities must begin devising their own information networks including mesh networks and local Internets with local and open source alternatives to Facebook, Google, and other corporations exercising the same unwarranted power and influence online that bankers and industrialist exercise over traditional society. Hasbro Play-Doh Goes ILLUMINATI!!! Sells Dildos To Little Children!